As with the annual calendar of national competitions [post & page], all comics from this post and comments will be consolidated into a page for future reference, see Pages on sidebar. The first two comics are by artist I have worked with. The rest are in no particular order. Fergus the Horse. Fergus is drawn by Jean Abernethy, the brilliant illustrator for part of Back to Eventing and all of Back to Riding. Illustrator has to be an even tougher gig than artist. I would send her 500 words of blather, without a single concrete noun to be found. She would send back an image that exactly captured what I was attempting to say. The whole experience was so amazing that, if I ever write a book, I will argue to the furthest extent of my contractual ability for said book to be illustrated. Horse Life. I tried to continue with illustrations for Rodney’s Saga but stumbled at the realization that daily works much differently than monthly. Well, duh. I contacted several artists but gave up after the first. Through no fault of the artist! I couldn’t figure out what I wanted. Posts with illustrations from Sara Light-Waller: Big Bad Bunny, Massage Master Class, Horse Dreams, That Other Horse, When I was a Colt I Served A Term. Not, alas, Dark Horse Comics. The links show up all over a Google search but DHC is not equine. What horse comics have you found out in the ether? 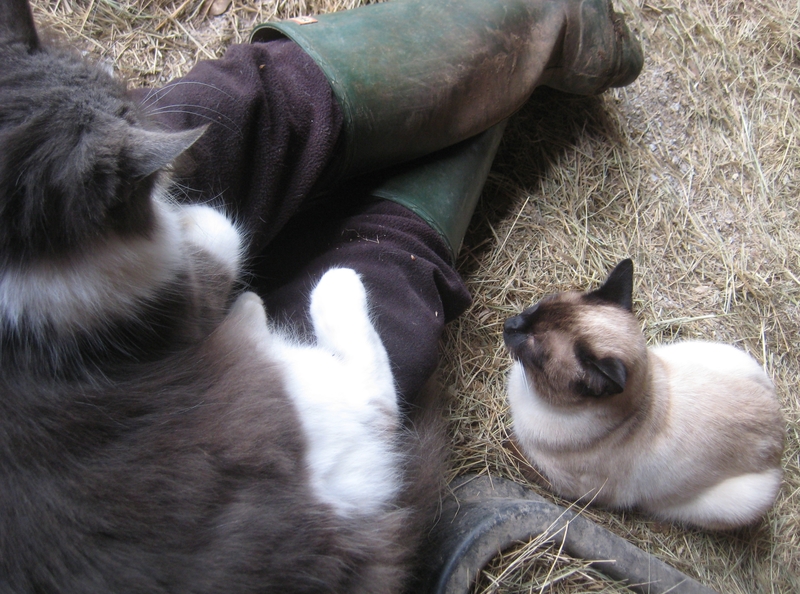 Barn cat turf wars. Round to Arthur. Pages is the 4th box under the Haynet badge. Unless it doesn’t show up on your system, in which case LMK. Comic page will be created once all the ideas are in. Can you see the page anyway?